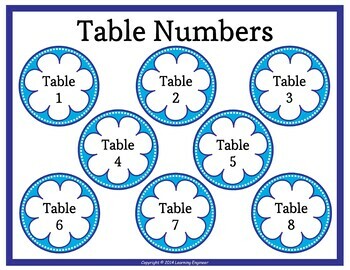 Table Signs: Group Signs - These classroom table number signs or group numbers look great hanging above your classroom tables. 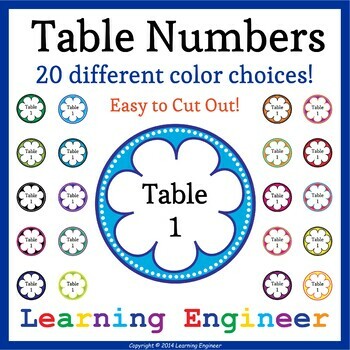 I made 1 thru 8 table numbers for each color, but if you need more table numbers, let me know : ) Many times teachers who use tables will also use crates on counters or stacked next to the student tables. I put a matching sign on the corresponding crate. There are 20 different colors to pick from. 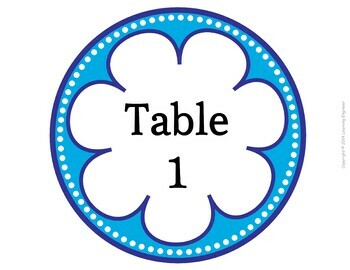 You can pick a different color for each table or use the same color for all your tables. Print on cardstock, cut out, glue back to back and laminate. I have provided a template for the in between piece that prevents the opposite sides from showing through. 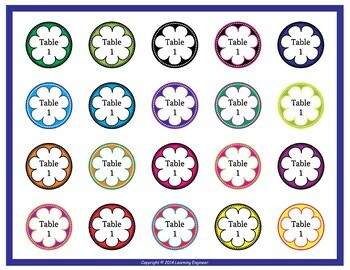 These should last years if you laminate them and it prevents them from curling. If you’re an individual educator or a school representative purchasing a Non-Transferable License, your license is Non-Transferable. This means only you or the educator this license was purchased for may use it, and the license cannot be reused by another teacher. If you represent a school purchasing a Transferable License, your license is transferable. This means only one educator may use the resource at a time, and if you experience personnel changes year over year or during the year, you may transfer the license to another educator in your school.